The Dutch would fire the first shot in what would quickly escalate into an explosive war of pamphlets. In July 1624, the first pamphlet, A True Declaration of the News that came out of the East-Indies, was published in Dutch and rapidly translated into English. It was widely believed that Boreel, a director of the VOC, had written the pamphlet but no conclusive evidence was offered. 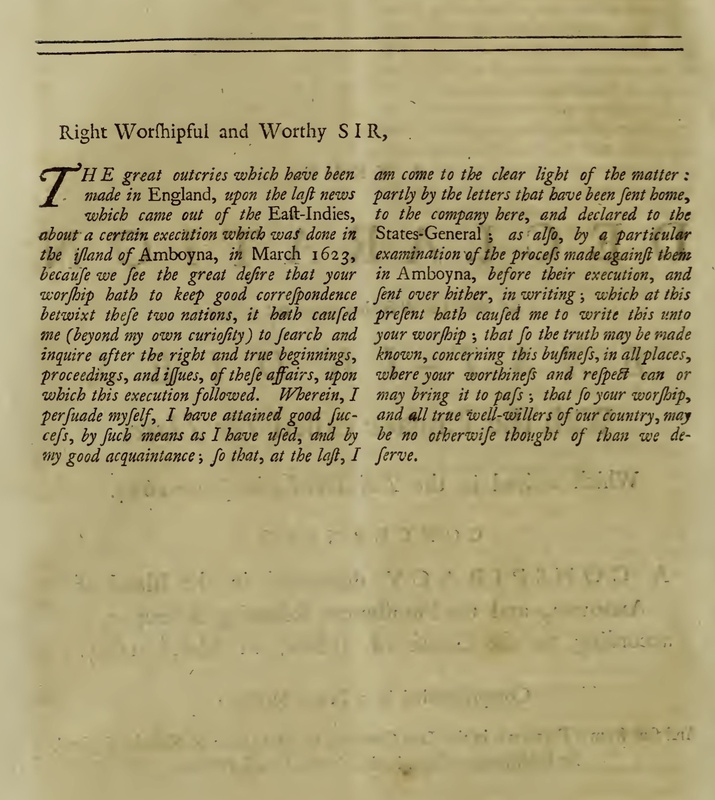 The directors of the VOC, who were intent on maintaining the peace with England, denied that they had commissioned the pamphlet and declared that it was “a scandalous libel” but there can be no doubt that they at least approved of the version of events contained in the pamphlet. The pamphlet attempts to systematically demolish the Defense's major objections to the case. It is written as a personal investigation by an impartial observer determined only to get to the bottom of the matter but in reality it was either directly commissioned or implicitly supported by Dutch East India Company officials. The pamphlet emphasizes the “full uniform examination and confession” of all the accused. The great outcryes which have been made in England upon the last news which came out of the East Indies about a certain execution which was done in the island of Amboyna in March 1623, because we see the great desire that your Worship hath to keep good correspondence betwixt these two nations, it hath caused me (beyond my own curiosity) to search and enquire after the right and true beginning, proceedings, and issues of these affairs upon which this execution followed. Wherein I persuade myself I have attained good success, by such means as I have used, and by my good acquaintance, so that (at the last), I am come to the clear light of the matter.